Well kiddos, winter is here, even in Calabria. That means it’s time to warm our bones with one of the simplest, tastiest, warms-your-bonesiest What’s Cooking Wednesdays you’ll see here–Bollito di Manzo. Translated literally it’s “boiled meat,” so let’s not say that because that sounds rather, well, ew. 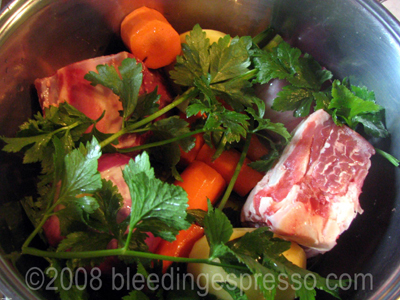 And what it really is a kind of beef stew without the thickening agent, and it’s one of our staples here during the colder months thanks to P.
Now I don’t know how you normally make stews and soups, but I’m used to chopping things up into bite-sized pieces. Not with bollito! All you need to do is peel and clean everything and put it in a pot with water for a couple hours. Seriously, can it get any easier? 1. Pour olive oil into medium sized pot and then add meat. 2. Prepare onions, carrots, celery, and potatoes and add them to the pot. 3. Cover everything with water. 4. Simmer on medium heat, adding some salt after about an hour. 5. About fifteen minutes before two hours is up (give or take), put water on to boil for pasta and then prepare pasta as usual. 6. Remove meat, onions, carrots, celery, and potatoes, and put in a bowl for serving. 7. Add pasta to broth and serve. At this point, I chop up some pieces of everything and add them right to my soup and eat it all together; P normally just leaves everything separate, taking bites of meat, onion, carrot, celery, or potato in between spoonfuls of soup. You may do as you wish. You may notice that my celery looks more like parsley, and that’s because it’s Calabrian celery called “ace” (AH-chay). The stems are super thin, but it tastes exactly like celery. Go figure. Sounds good as Winter is coming back here in Connecticut. Of course it is a bit of work finding the good ingredients here. I have faith in your market skills, Gil! Yum…perfect for a winter day! nyc/caribbean ragazza’s last blog post..Silvio B.’s misstep? This dish always makes me think of some old commercial…”set it and forget it!” What was that for anyway?! Oh, that looks so yummy!!! 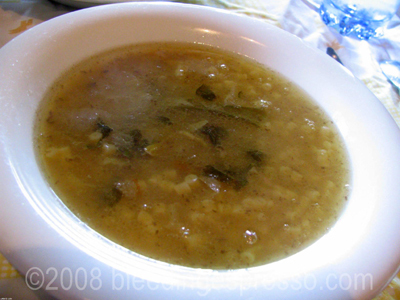 Here up North, we skip the soup but make a a sauce with chopped herbs, garlic and olive to drizzle on the meat. That is the *royal we* I’m using because I rarely make this. 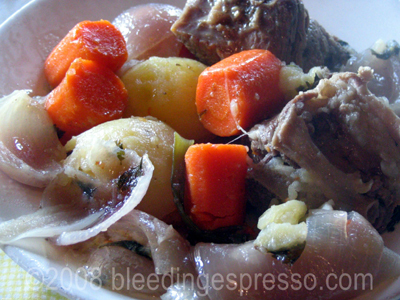 Bollito, like so many things here, is very regional and prepared differently (well, in this case, actually prepared the same way but with different ingredients). Here bollito includes veal, chicken, sweetbreads, tongue and is served with red sauce, green sauce, and with mustard and honey cured fruit (all three in little bowls to dip). But the principle is the same. Bollito is a type of comfort food, and there is a small (really tiny, 6 tables) local restaurant here which makes it every Saturday night in the winter, and even people who get turned off by the idea of it end up admitting its pretty darn good! Too funny…dipping would *never* fly down here! The tongue and whatnot (of pigs) are left for frittole…yuck. Quick, easy and comforting – what more could you ask for when its +5c outside and damp and the cold is eating into your old (well okay my old) bones. And this will become a winter staple in our household. I must be getting aclimatized, I now find 5c bloody cold – me that use to shovel snow in -35c back in Ottawa. I hear you Willym! My cold tolerance has definitely dropped in just five years here…almost afraid to go back to where it *really* gets cold! Mmmmm. Comfort food. Me loves a good stew-Italian or otherwise. Thanks! Simple always works for me. You know, I still can’t get used to eating one thing at a time, like pasta or rice……alone…..and then meat or fish…….alone. This was obviously someone’s clever way to extend a lunch or dinner break. It’s like the Italian version of my “Happy Soup.” Kind of. I love the presentation! Hee hee…happy soup indeed Nino! We have a similar dish here – perfect for those chilly days. Even though it doesn’t get as cold here as it does in PA, like you my cold tolerance has definitely decreased. Isn’t it crazy, Mary? I blame the humidity here though, and these stone walls! Great recipe! And I’m intrigued by the Ace celery. I’ve never seen it here in Milan. When I had my mother-in-law’s bollito for the first time I didn’t really recognize all the cuts of meat floating there so I stuck my fork in and hoped for the best. To my horror, what came out was a giant grey tongue. Yuck! I promise if you come to my house, the only tongue you’ll bite into is yours, mistakenly. Blech. Er, to each her own! I think your celery is pretty much what my farmer grows – same type of thing. This looks wonderful. It’s pretty similar to pot roast in a way. I love things like this. Yes just right for a wintery day!!! So you eat the soup separately …or does it not matter? This looks wonderful! Just the ticket for our cold winter days. We had continuous snow for the Thanksgiving weekend and I love to make soups this time of year. If you can’t find veal on the bone, would beef work okay? Absolutely! We just don’t get beef here, so everything is veal. This looks so wonderfully hearty and warming. And I love the addition of ditalini in it! Mmm…..
Oh the bouganvillae are ‘love’ly…happy day to P , happy blogerversary to you dear Michelle…& the soup is soul stirring & warming! I love this in the winter in Tuscany. I also like to prepare minestra di farro as well. Both very hardy and inexpensive winter dishes. Thanks. I don’t see much farro around here, but it’s definitely tasty. Thanks for coming by!